I hope you all are having a fabulous Memorial Day weekend, here in the US. If you are abroad, I hope you had a great weekend and even better week ahead! I wanted to thank you all who made the whipped milk ice-cream and left comments to tell me how much you enjoyed them! It means the world to me that someone is actually reading my blog, but to have you come back and tell me you made something using my recipe and you loved it – it melts my heart! 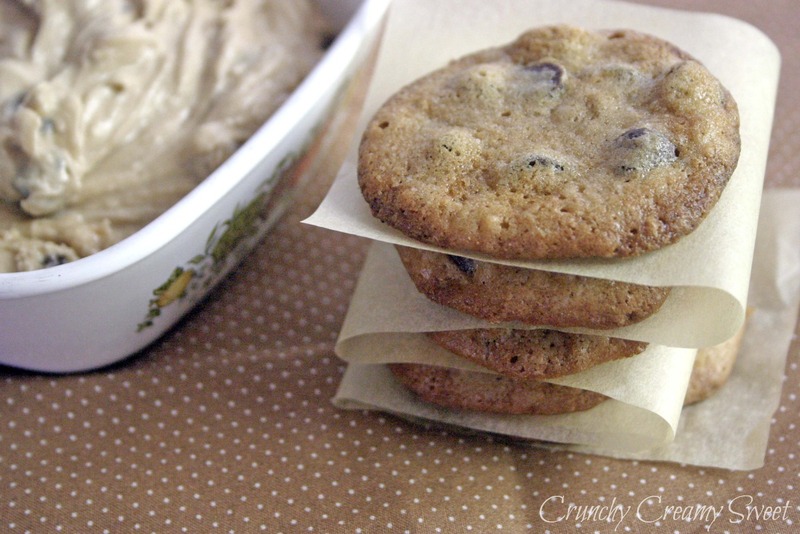 For another installment of CCC Monday, I chose the eggless version of chocolate chip cookie. If you have a sweet tooth, there is a big chance you like raw cookie dough, the one that’s safe to eat. Have you ever tried to actually bake cookies from it? I have not, until now. I was very excited to see what cookies will it produce. 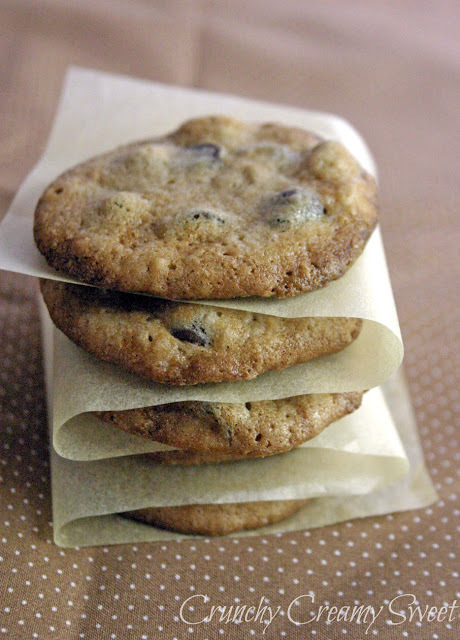 I am here to tell you, that if you like your cookies crispy-crunchy – this version is for you! They bake beautifully, have a nice crispy ring on the outside and a crunchy inside. Is it the ultimate CCC for me? No, but I really enjoyed these cookies. And so did everyone in our family! They have a delicious caramel taste to them and the crispiness makes you one happy cookie-eater! For this version of CCC, I took the recipe I have been using for years and simply didn’t add the eggs. I left the baking soda so the cookies will brown nicely. Also, because we had a very hot week, I refrigerated my dough overnight so it was easier to handle. Preheat your oven to 375 degrees. Line your baking sheet with parchment paper or silpat. In a medium mixing bowl, whisk together the dry ingredients ( flour, soda and salt ). In a large mixing bowl, cream together the butter and both sugars, until light and fluffy. Add milk and vanilla and beat until combined. Now switch to a spatula or a wooden spoon and stir in the dry ingredients. Add chocolate chips and stir again. Do not over mix. 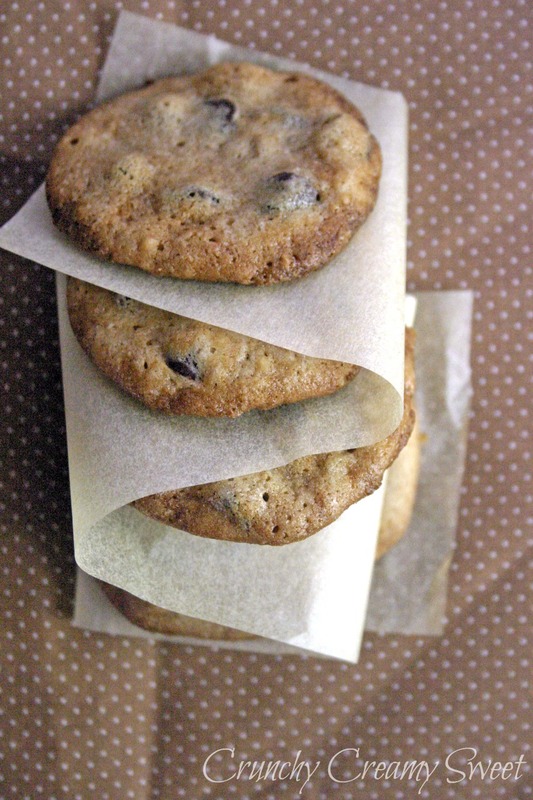 You can scoop the dough onto your baking sheet now or refrigerate the dough overnight. I made teaspoon size balls, placed them on the baking sheet and flatten them gently. Bake in 13-15 minutes. Watch them after the 12th minute, as they will brown quickly after that. Cool on the sheet for 1 minute, then transfer to a wire rack to cool completely. Oh my, these are perfect for my one daughter with food allergies. I’m so glad you reposted these since I only started networking in June of this year. Hi Anna, came across this on Pinterest. I've been trying and testing a lot of eggless chocolate chip cookies too since couple of months (the ones in Starbucks & other stores are so not worth it!) 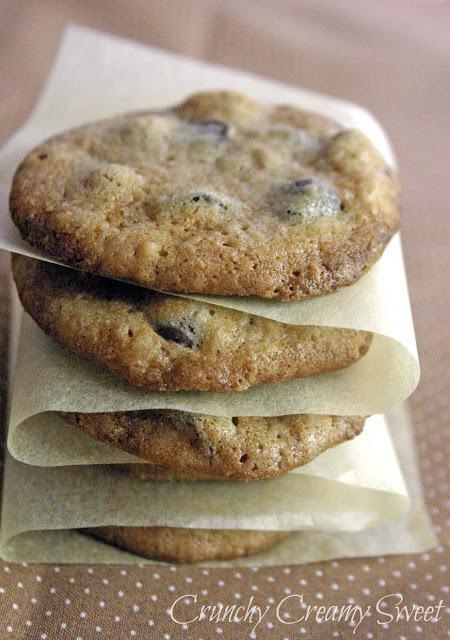 – with milk, yogurt, banana puree, applesauce, etc etc etc to know what difference they make to the cookies. You've got a wonderful blog! You can make cookies without EGGS???? I had no idea! Especially ones that look so delicious! I think I'll enjoy CCC mondays from now on! Right? Thank you so much, Jeff! Never tried CCC without eggs, but since its crispy I know my daughter will love it because she likes crispy ones and my son likes chewy ones :)Bookmarked!! I hope you will try these, Soni. So yummy! Thank you! 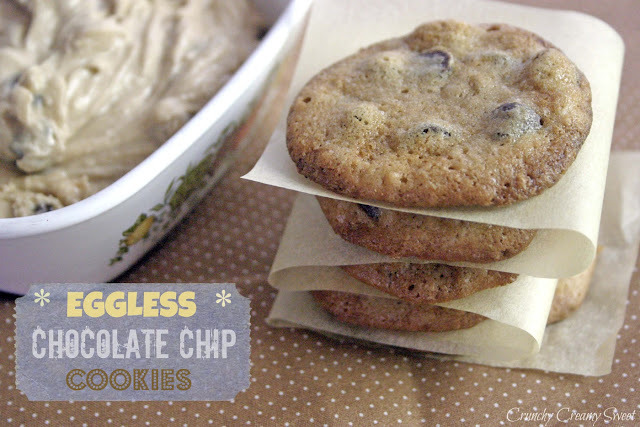 Those eggless cookies are absolutely fantastic! I am going to try the recipe too. Yay! Thank you so much, Angie! This looks so awesome. Perfect dish for any veggie. I know what you mean, Jessica! But it's like two treats in one! 🙂 Thank you! I have to say, it was a delicious experiment 🙂 Thank you, Ramona! I've made this dough a lot…but never actually baked it! 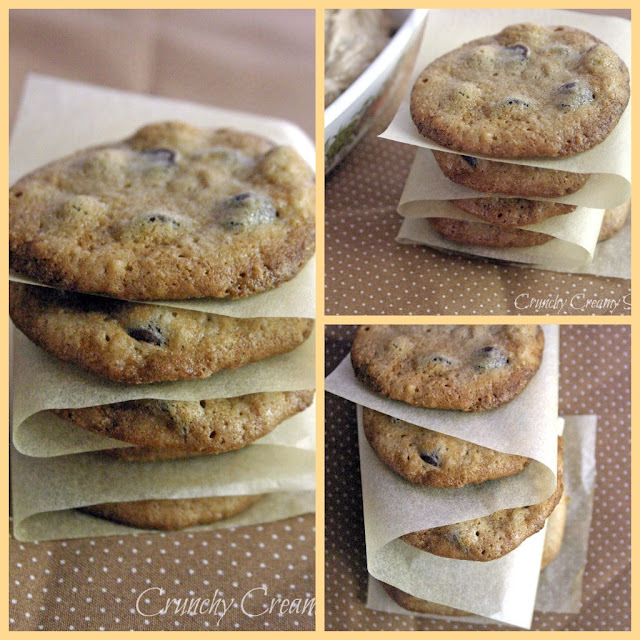 My husband loves crispy cookies…I have got to make these for him! Looks awesome! I love a good cookie and this one looks great. My college roommates would attest to how much I love eating raw cookie dough. It's kind of embarrassing, really! hahaa, I'm so glad there's a healthier (relatively) recipe for me to indulge in! 😀 I need to remember this for a future pregnancy, whenever that may be! I hope you do try to bake at least one batch from the dough next time! lol Thank you, sweet Ann! Looks fabulous sweetie! I am waiting for the best recipe so I can test it out! I too love a good chocolate chip cookie! Have a fabulous week! I can't wait to join up on Friday! Me too! Thank you, sis! How cool is this! There are a lot of raw cookie dough recipes out there for just eating as is, but I never even thought of how they would do baked! It looks like these were a success-yum! Keep up with this series and have a great day!